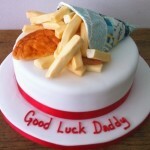 We regularly get asked to make food from sugar or make cakes in the shape of different food and we love it! 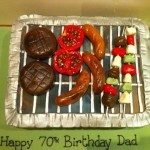 Food cakes are a real challenge in making them look realistic and so satisfying when people can’t believe that what they are looking at is made from sugar. 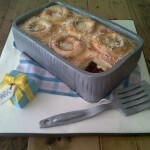 My favourite was the giant All Day Breakfast cake we made for the award do of a company called Target Jobs. The cake was over a metre in length and a real talking point. They don’t all have to be this big as the other ones attached show. 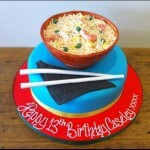 We can make anything and everything out of cake and we love a challenge so get in touch with your food cake requests! We love trying out new designs and cake ideas so if you are inspired by something you’ve seen then let us know and we can talk over a cupcake from our delightful tea shop in Southfields. You are also able to order online so give us a call or contact us with your requirements and we will get back to you straight away.